Someone once said ” When the planets all align, and the stars shine brightly, those standing under them will be gifted by what they experience that day” And so we were ! With the impending weather forecast, who could have guessed what a beautiful day we would have for the meet ? My guess is it’a because of all the great people that gathered to trade stories, motors, parts and just friendship. On our way to the meet I kept looking to the west seeing the gathering clouds and thinking we are going to get drowned or even worse snowed upon ! Nothing could have been further from what happened. As we were all going around checking all the cars, trucks and vans for that one special thing we needed or that rare motor we just had to have, the sun came out and it got warmer ! I don’t think anyone wanted to say anything for fear of jinxing the day, but it just kept getting better ! 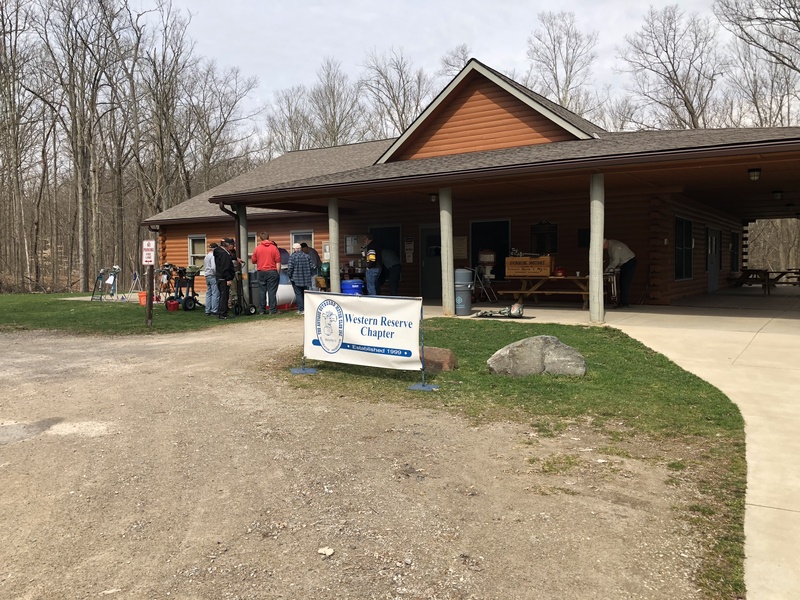 As I unloaded our WRC banner and took it up to the lodge to set up, I noticed a number people were already there setting up motors for display and some getting them ready to run in the test drum ! One of the first guys to catch me was Chuck Thomas and his son Howard. I had been corresponding with Chuck about his little Johnson opposed twin that he wanted to try and get running. So we dove right in on it ! 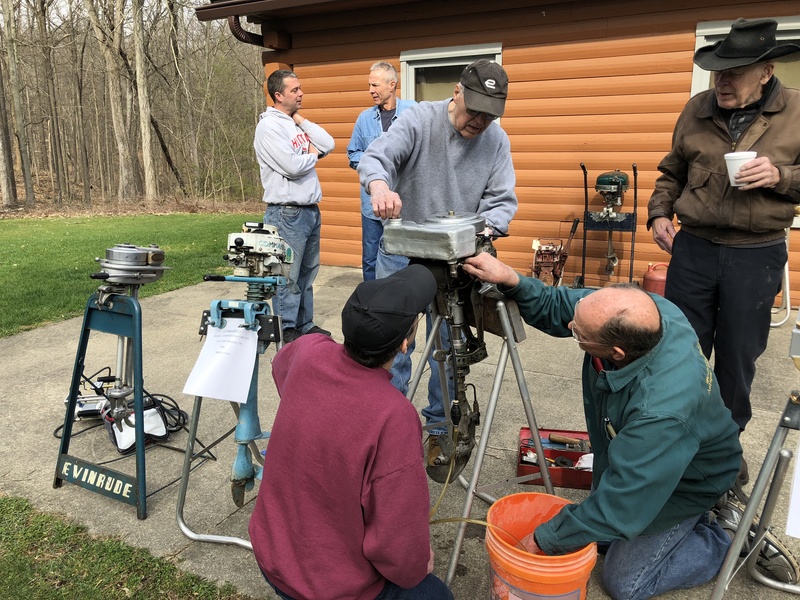 Howard had brought an electric starter he converted to start the little Johnson, he told us it was actually a starter for go-carts that he added an adapter to fit the nut on the flywheel. It turned the engine over very easily and got it running in short time. Only problem was it wasn’t pumping water. So we pulled the check valves on the pump and soon it was pumping nicely and running like a true Johnson. Our Ryan Hollingsworth horizontal style test tank proved to work out quite nicely ! Even tho it was built by a less talented carpenter, it got a good work out by Tommy Mizen when he proved you wouldn’t want to arm wrestle him in a contest, by not giving up on a stubborn little Johnson 5 1/2 till he had it running like a champ ! Several other motors were dunked in the tank and soon were running great ! One thing I should mention is, Thank you to everyone for bringing all the jugs of water to fill up the drum, I wasn’t sure if we’d have enough but we had plenty ! Another thanks goes to Domonic Durda for bringing the test drum & frame in his truck so I didn’t have to dismantle it to fit in mine ! We had plenty of people show up with motors for sale and a few with questions about how to get theirs running. 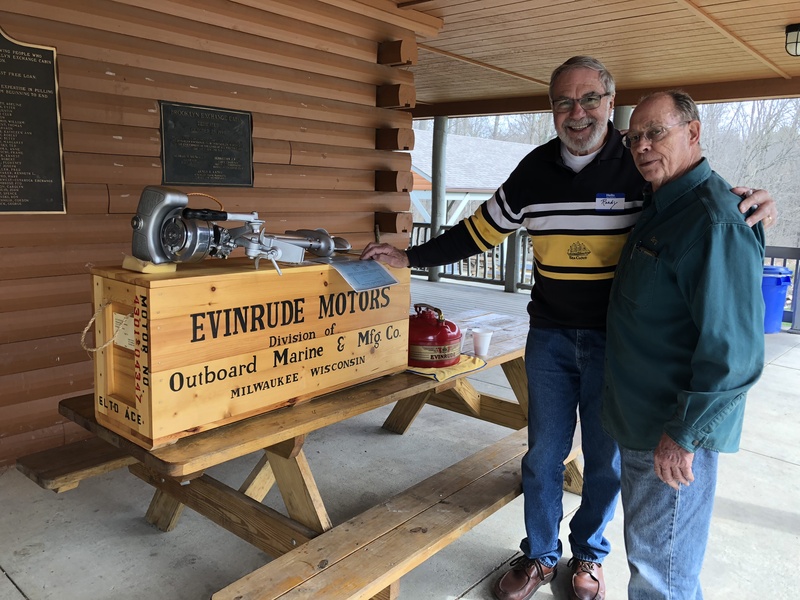 One was an Evinrude Speeditwin that I heard there was a bid on at $45 Sure hope he got it for that ! We were very pleased to sign up several new members to our club, I think everyone made them very comfortable and welcome ! I would like to name everyone that came but alas my memory isn’t good enough to remember them all ! So best I can do is say thanks to all that attended and I hope you enjoyed the day as much as I did ! My big reward was getting my recently restored Hiawatha 7 1/2 / 10 hp motor running ! Lunch was ready about 11:30 and if you didn’t eat your fill you missed out on a great meal ! TJ and his helpers did a fantastic job, the meal consisted of salad, rolls, fried chicken, (YUM ) ham, potato-salad, chips, macaroni and cake for desert ! Plus the coffee in the morning with Donuts and other goodies ! And there was plenty to go around ! So another big Thank You to TJ Fitzgerald, Jim Fordosi, Dave TJ’s neighbor, Chip Rabbit and the others I didn’t get to meet.